1. If there is a chance that rain will crash your outdoor wedding, create an alternative plan and let your guests know ahead of time. 2. If your wedding is outdoors, rent a tent to keep everything and everyone nice and dry. 3. Bring extra umbrellas and towels for your guests. 4. Have blow dryers and different toiletries in your venue's bathroom just in case your guests need to freshen up. 5. 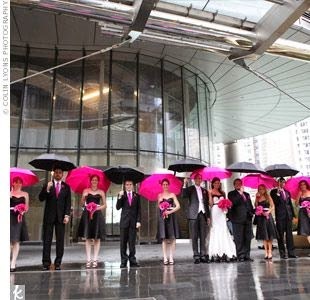 Pick a venue that accommodates indoor and outdoor weddings in case things need to be moved inside. 6. Welcome the use of rain boots.